The East and West Allen Valleys are distinctive landscapes with a fascinating history. Allendale, with is central market square surrounded by delightful cafes, shops and art gallery is well worth a visit. The Allen Valleys are a hotspot for biodiversity and they contain large areas of important habitats like upland hay meadows and blanket bog. The National Trust's Allen Banks and Staward Gorge is one of the largest ancient woodlands in Northumberland. Allen Banks is great for wildlife including dormice, otters and roe deer and you'll find up to 70 different species of birds. Allenheads and Whitfield are both great places to start a walk. If you prefer a slower pace, why not sample the award winning ales of the Allendale Brewery. 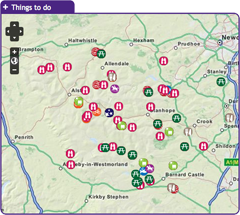 To discover what the Allen Valleys have to offer click on the map and start exploring! In spring and early summer the ancient woodland at Allen Banks and Staward Gorge bursts with the songs of birds such as the wood warbler and willow warbler, song thrush and wren. At quieter times of year these woods are still well worth a visit. In autumn the trees are a blaze of orange and yellow while rich clusters of fungi decorate the woodland floor. Even in winter, the activity of resident woodland birds provides a welcome contrast to the comparative quiet of the surrounding countryside. The National Trust car park at Allen Banks and Staward Gorge (NY797641). A 4km circular walk at Allen Banks, exploring landscape, rocks, plants and evidence of an industrial past. Starts from the National Trust car park at Allen Banks (NY798640). Pay and display for non-National Trust members. Located just off the B6295, approximately 1.5 miles south of Allendale Town. Allendale is a perfect stopping point for a journey around the North Pennines. Pop in to the visitor information point in Allendale Market Place to discover places to visit, eat and stay. From the Market Place you can set out on foot along the river or head up to on to the fells for panoramic views. A 20 mile circular route that takes you from the centre of Allendale, through rural Northumberland, to reach the spectacular ancient woodland at Allen Banks. Note that this electric bike route was originally devised in 2015. It is still valid but some of the information (e.g. hire/charge points) may have changed. Circular route starting at Allendale Post Office (NY837558 / NE47 9BJ). This 34-km cycle route is a circuit of the East and West Allen Valleys. It is best cycled anti-clockwise. The southern section is part of the C2C Cycle Route and provides an easy link to Allenheads. A shorter circuit is possible, diverting from the main route at Hartleycleugh and crossing Dryburn Moor and continuing down into Allendale. Along this route two chimneys can be seen which are remnants of Allendale's mining heritage. Flues and chimneys formed part of the condensing process, and took fumes from the smelt mills up the valley. Valuable deposits of lead collected within the flues, and periodically small boys were sent through to collect it - not a pleasant job! Please note that the original leaflet was produced and printed in 2005. The routes are still valid but some of the information (e.g. refreshments and facilities) might be out of date. This 15-km route follows the upper valley roads but is generally less demanding than the other 3 Allendale routes, despite one very short and extremely steep hill at Acton Burn. This is followed by a series of generally upward undulations leading to a glorious descent back into Allendale. A longer alternative route takes in both Dryburn Moor and a part of the C2C Cycle Route across Swinhope Moor. The remains of an early 17th Century bastle house called Rowantree stob can be seen off the cycle route near Pry Hill Farm (NY839512). These fortified homes were built by landowners to protect their families and livestock from Border Reivers. You can visit the bastle ruins by following Isaacs Tea Trail - a public footpath. Please note that the original leaflet was produced and printed in 2005. The routes are still valid but some of the information (e.g. refreshments and facilities) might be out of date. This 14km route is for the more adventurous cyclist, with a steep ascent and descent to cross the River East Allen at Oakpool. Several continuation options are available at Keenley. Nearby is Keenley Chapel the oldest Methodist Chapel in the Allendale area and it is one of the first to be purpose-built in the North East. It was built in 1750, rebuilt in 1875 and is still in use. Many Methodist chapels, some now converted for domestic or other uses, can be seen throughout the AONB. Please note that the original leaflet was produced and printed in 2005. The routes are still valid but some of the information (e.g. refreshments and facilities) might be out of date. Take a 2 hour walk around South Wooley Farm in Allendale and get close to one of the world’s rarest and most endangered habitats, Upland Hay Meadows. There are only about 11 square kilometres of upland hay meadows left in the whole of the UK. Just under half of these are here in the North Pennines Area of Oiutstanding Natural Beauty (AONB) and UNESCO Global Geopark. This walk takes you along country lanes and public footpaths through, or alongside, several hay meadows on the farm. Please keep to the paths, leave gates as you find them and keep dogs under close control, preferably on a short lead. Starting from the car park in Allendale Town (NY837558). Family-friendly trail around Allenheads. Developed as part of the Dukesfield Smelters and Carriers Project (www.dukesfield.org.uk). Allenheads in the East Allen Valley. The landscape around Allenheads has been over 300 million years in the making. From tropical seas and deltas to minerals and miners – all have played their part in shaping this beautiful landscape. This 5km circular walk will introduce you to some of the special features of the landscape around Allenheads. By spotting clues in the moors, fields and buildings you’ll find out how to read the landscape and discover more about its fascinating past. Starting from Allenheads car park (NY859453 / NE47 9HJ) in the East Allen Valley. Tony and Linda Beck run BECKs Training Ltd, headquartered at their outdoor activity centre and group accommodation venue Deneholme in Allendale. Traditional adventurous activities are delivered within the North Pennines Area of Outstanding Natural Beauty (AONB) and beyond in rural Northumberland. Activities are facilitated to groups of at least 8 people and they include ghyll scrambling and gorge walking, mine exploration, rock climbing and abseiling, canoeing and raft building. Mountain biking, bush craft orienteering and navigational fell walks, archery and high ropes activities. All activities are facilitated by experienced, local instructors who hold all the relevant NGB qualifications, are additionally in house and site specifically trained and have undergone all required checks to work with children and adults alike. They are passionate about their activity, knowledgeable and enthusiastic about passing on their skills. BECKs can provide transport and packed lunches, whilst always providing all relevant equipment – no prior experience is required. Canoe Building Courses Coatenhill Canoes run courses in the Allen Valleys where participants can construct an open timber canoe from scratch. All materials are provided for the courses. After four days building you can take away your canoe ready to paddle! This 33km route takes you from the mining village of Allenheads, over to the West Allen via the C2C and onto Dryburn Moor. From there you get stunning views of the East and West Allen, and looking north, the Scottish Boarders. Note that this electric bike route was originally devised in 2015. It is still valid but some of the information (e.g. hire/charge points) may have changed. Circular route from The Hemmel Cafe, Allenheads (NY859453 / NE47 9HJ). A lovely 5.5 mile (9km) walk from Allenheads exploring the wonderful wildlife of wildflowers in the East Allen Valley. This circular walk will introduce you to some of the special plants of the North Pennines and the creatures that depend on them. Along the way you'll discover plants that are adapted to the harsh conditions of the area and get a bee's-eye view of finding food. A short route that takes you out of Allendale Town where you can get some of the best views of the East Allen Valley. Note that this electric bike route was originally devised in 2015. It is still valid but some of the information (e.g. hire/charge points) may have changed. Circular route starting from Allendale Post Office (NY837558 / NE47 9BA). Isaac's Tea Trail is a long distance path inspired by the tale of Isaac Holden. Not only a tea seller, Isaac was a local philanthropist and the trail takes you past many legacies of Isaac's fundraising. This walk combines a number of different North Pennine habitats to dramatic effect. You will pass through an expansive area of rushy allotment adjacent to heather moorland where in spring and summer the air is alive with the sounds and sights of numerous breeding waders. The views across the South Tyne Valley are similarly impressive. By contrast, the second leg of the walk passes along the route of a disused railway line that is largely clothed in woodland, offering tantalising glimpses of the surrounding countryside and excellent opportunities to see and hear woodland birds. The walk centres on Lambley Viaduct, a stunning landscape and architectural feature from where the River South Tyne and its wildlife can be viewed from on high. Lambley Viaduct – South Tyne Trail car park (NY679595). A beautiful circulare walk through the meadows to the north of the Allen Valleys. This walk includes sections along farm tracks and footpaths through fields. The Sinderhope Pony Trekking Centre is based on a traditional working hill farm in Northumberland which is surrounded by miles of beautiful moorland. The Centre offers treks of various lengths to suit all abilities, riding over moorland and through dales on our cobs and native type ponies. Lessons last 30 minutes or 50 minutes and they are taught in the indoor arena which provides a safe, enclosed and dry environment, with horses and ponies to provide a range of sizes, types and temperaments to suit everyone from the complete beginner to the competent rider. Canters are arranged for the more experienced rider, while basic instructions and support are offered to the nervous or novice rider. We also provide private trekking for individuals or groups if you would like to go out on your own with one of our guides, these sessions are subject to availability. High Sinderhope, Sinderhope, Allendale, Northumberland, NE47 9SH. This walk epitomises much that is characteristic of the North Pennines Area of Outstanding Natural Beauty (AONB) and UNESCO Global Geopark. High peaty moorland, the sweet melancholy call of the golden plover and the towering remains of chimneys from the area’s lead mining past. All this is surrounded by sweeping views of the dales and settlements below and can be reached without a strenuous climb! Originally a country railway station on a line running through the Langley woods, this garden is a beautiful and tranquil place. The Garden Station sells perennial plants throughout the summer. There are also artwork displays inside and outside the station and a wonderful fairtrade café. A woodland walk was created in 2003 along the old railway track between two arched bridges and it is bordered by plants which thrive in woodland conditions. A wide range of art and craft and sustainable living courses are available from the station throughout the year. Set on the steep valley sides of the river Allen, a tributary of the south Tyne, explore the woods and see what wildlife you can spot on this gentle riverside walk. It's the largest area of ancient woodland in Northumberland and has been here since at least medieval times. This long history has helped make it a fantastic home for flora, fauna and fungi. Starting from Allen Banks car park. This 9.5km walk between the stations of Bardon Mill and Haltwhistle is largely along field paths with some road walking mainly in Haltwhistle. This walk crosses the busy A69 - please take care. Bardon Mill has a general store and a pub while Haltwhistle has a full range of shops and facilities. Starting from Bardon Mill Station. This set of 3 walks from Allendale Caravan Park showcase the distinct beauty and character of Allendale. On the walks you will pass through pretty hay meadows, see remnants of the areas lead mining past, encounter the abundant wildlife of the region and be exposed to the dramatic moorland landscapes on the fell above the town. Starting from Allendale Caravan Park.